This week, we'd like to introduce you to our reader Valerie's family of six. Valerie has been writing about blended family on her blog, Life in a Blender, ever since marrying her husband, Joe, in May 2013. Below, Valerie tells HuffPost Divorce about how she and Joe have been managing the highs and lows of blended family life so far. Hi Valerie! Please introduce us to your family. 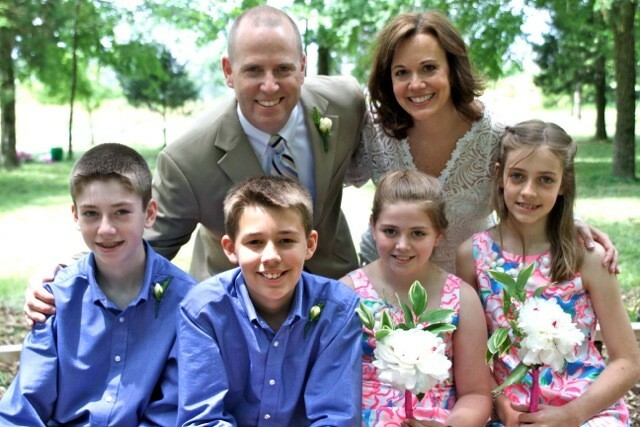 Our new party of six is made of me and my husband, Joe, and our kids: Will, 14; Warren, 13; Hattie, 11; Crawford, 10. When we talk about “our family” with the kids, we include everyone -- my children’s father, his wife and their daughter; my bonus kids’ mother; and all the grandparents and aunts and uncles on all sides. We like to focus on the fact that our family is still OUR FAMILY –- we just look different now. Joe and I have known each other since we were teenagers. He dated one of my best friends when I was in 9th grade and I remember being so jealous of her! Twenty years later after both of our marriages ended, we reconnected on Facebook. We got married on May 11, 2013 so we are only in our fifth month as a blended family. I started my blog the week after our wedding. It is all about our accomplishments and challenges in our new normal as a blended family. I truly believe what I have learned over the years will be helpful to anyone who finds themselves in one of the many roles I have had: wife, ex-wife, ex-wife with ex-husband dating, ex-wife with ex-husband married, ex-wife with ex-husband having a new baby, single mom dating divorced dad with kids, single mom marrying divorced dad with kids, "new" wife" and stepmom. What would you say have been some of the biggest challenges of blended family life? Maybe it’s because our kids are the same ages and would have been friends even if we weren’t married, but our transition has been relatively smooth thus far. Probably the biggest issue has been that Joe and I have different parenting styles. His kids are enjoying my more laid-back approach to parenting, while my kids have had a little trouble with more rules. At the same time, his kids are having to get used to the fact that since my kids and I have been a party of three for nine years, we openly talk about anything and everything. If we have a problem, we discuss it. That’s a new concept for them. Thankfully, we are all so excited about our new family that we are willing to learn to accept change as a part of life. Now that we have double the family, we have double the love and double the fun! There is truly never a dull moment in our house. Although my calendar looks like some sort of strategic war plan with as all the markings and colors, I would not trade it for the world. One of my favorite parts about our blended family has been being active in the lives of my stepkids -- helping with homework and assisting at soccer practices has been a bonding experience for us. Being a stepmother has been more gratifying than I would have ever expected and I love them like my own. I cannot even begin to express how proud I am at how well our children have transitioned. Although there have been a few challenges, the kids have shown from day one that there is nothing STEP about them. I will never forget the night before the wedding I heard my son tell my stepson, “I love you.” He quickly added, “I can say that now because we’re brothers.” The laughter and love that we witness in our home on a daily basis makes it all worthwhile. We are smart enough to know it won't always be this easy, but we are building a strong foundation now so that as a family we can handle whatever trouble we may face. Don’t lose hope! When you have a blended family, there are numerous people involved -- some of whom may not be quite as excited about your union as you are. As I say often in my blog, control what you CAN control. Do not allow outside forces to weigh heavily on you, but focus every ounce of your energy on your family (most importantly, your marriage) and try to make the transition as seamless as possible for the children. Make sure you have open communication with the children and your spouse -- we established a “safe word” so we can say something without being judged. It has been a fun way to get the kids to open up about how things are going and gives us an opportunity to figure out what we can do differently. Every day is a chance to learn and grow in our “new normal." Scroll down for more photos of Valerie and Joe's family.